See our frequently asked questions for more helpful information, or contact us to discuss menu options, available dates and for customized pricing for your event. A signed contract with deposit is required to hold the event date. The balance of the contract is due prior to the day of the event. For every 30 minutes past the confirmed service time, a $50.00 fee will be charged. There is an additional fee of $50.00 for events that are more than 25 miles from Holgate, Ohio. Table clearing of the entire hall following the meal is available for $150.00. 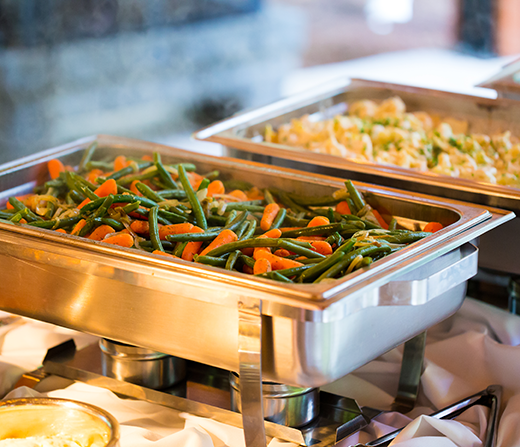 Buffet tables come complete with chafing dishes, utensils, linen table cloths and skirting. Cake cutting is available for a $75.00 fee. Head tables will be served at no charge if desired. Large containers for leftovers should be provided by the contractee. Final confirmation of menu and number of guests are required 10 days prior to the event. An additional beverage (punch, lemonade or iced tea) may be added to any buffet for $1.00 per person. Prices listed are average local market prices. Please contact us for a complete estimate for your particular event, including any necessary travel fees and applicable upgrades. Reserve our services today for your event.